Gundam Unicorn is the next installment to one of the best anime sagas in history, Gundam. Gundam Unicorn is a mecha series divided into seven episodes that span an hour long in content. After the success of Gundam 00, the creators added another story to the original timeline of their series. Gundam Unicorn takes place in the 0096 Universal Century where armed conflict revolves around giant machines known as mobile suits. Armed conflict is between the Earth Federation and the space immigrants that live in space colonies, The Sleeves. Armed conflict also revolves around a relic that is known as Laplace’s Box, and is said to be able to overthrow the Federation and destroy the world. The OVA centers around the story of a boy named Banagher Links. Banagher Links is a 16 year-old electronics student. Banagher’s colony was under crossfire between the Sleeves and the Federation and he stumbles into the Vist Foundation that has manufactured a new mobile suit known as the RX-0 Unicorn Gundam named after Gundam, being the first Mobile Suit developed by the Federation in 0078 UC. In that building he is entrusted with that Gundam which is the key to Laplace’s Box. This OVA is directed like a movie, unlike any other Gundam series ever created before. The animation is amazing and the art is awesome looking. The fight scenes are great to watch. There is CGI in the film but it is so well integrated that it blends in with the animation. The music is epic and is perfectly integrated into every scene. 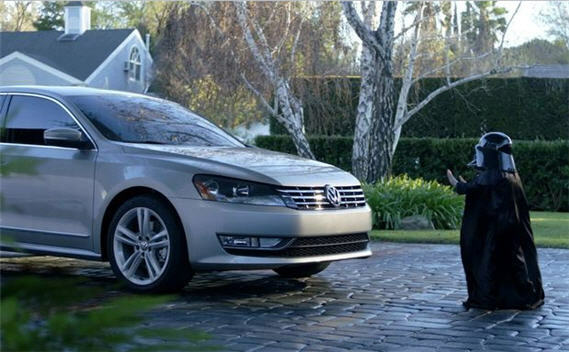 While the pile of garbage this year is smaller than last year, we couldn’t escape some terrible excuses for ads. Doritos should be ashamed. In their three years of serious Super Bowl advertising, their one good commercial came this year, involving the use of Dorito crumbs as a reviver. Otherwise, their ads are mean, painful to watch, and sometimes revolting (i.e. licking Dorito dust off another person’s finger/pants). 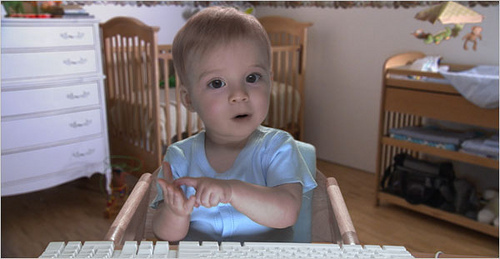 Snickers, E*Trade, and CareerBuilder.com have had some winning spots over the past few years, but this year saw a return of the talking baby, monkey bosses, and obscure celebrities behaving badly due to hunger. It doesn’t work more than once. What happened to Coke and Pepsi? Coke went twice for the cuteness factor, only to come off as boring despite vivid colors and decent premises. Pepsi’s bits were stereotyping both men and women, and none of their commercials were clever. Children and pre-teen television programming has developed a couple new faces recently. Recently, there’s been a renaissance of hand-drawn cartoons, most notably on Cartoon Network, aimed at the very generation that created the demand for entire channels of children’s programming. Shows like Animaniacs, Rugrats, and SpongeBob Squarepants brought us into the animated realm; Adventure Time with Finn and Jake and Regular Show are slowly bringing us back. 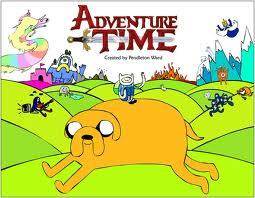 AS: Cartoon Network’s animated series Adventure Time with Finn and Jake is one of the best shows on television. Adventure Time chronicles the adventures of its two main characters, Finn the human and Jake the dog, as they explore the Land of Ooo. Finn is a twelve-year-old boy whose main motivation in life is to slay evil; Jake is a magic dog with the ability to change the size and shape of his body at will. CR: On the surface, Regular Show is a typical buddy comedy about a stoic blue jay named Mordecai and an eccentric raccoon named Rigby. The twenty-something bff’s work for and rent from Benson, the ill-tempered gumball machine, and are periodically visited by Skips the yeti, Pops the jolly British lollipop-shaped man, the High Five Ghost, Muscle Man, and Margaret the cardinal, Mordecai’s love interest. It’s a bizarre premise for a TV-PG rated show, but it has also caught our interest. The interactions between Mordecai and Rigby are a little like that of Dag and Norbert from The Angry Beavers, but other than that it’s hard to find something that isn’t completely unique. In the show’s pilot episode, the two heroes create a choreographed dance routine with the help of a magical keyboard to coerce their friends to give them money. 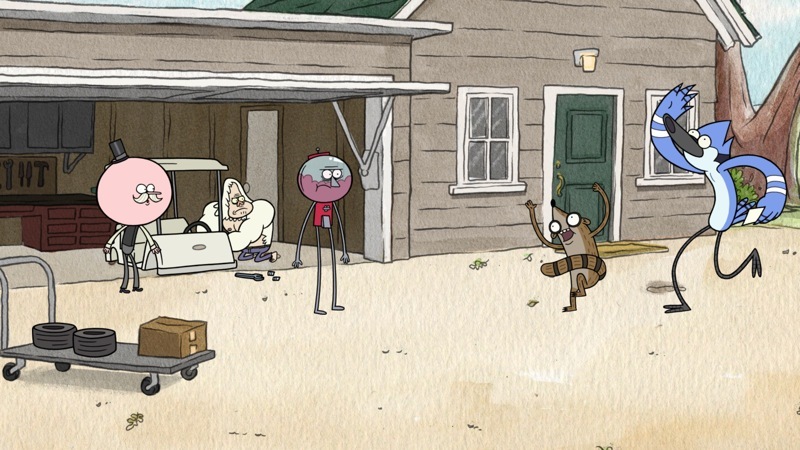 Rigby, however, abuses the power and accidently sends Skips, a bunch of baby ducks, and a soda machine to the Moon. It would take an inordinate amount of space to describe the rest of the plot. Outsourced is the most recent sitcom added to the NBC “Comedy Thursday” line-up. It’s a show about an American employee of a novelties company who must move to Mumbai, India to keep his position. The premise is that he must work with his Indian employees and explain to them the American culture while trying to understand the Indian culture himself. The show stars Ben Rappaport as Todd Dempsey, the Kansas-born native who must transfer to India to be the head of a company called Mid America Novelties. Second in command is Rajiv Gidwani, played by Rizwan Manji, who is sarcastic, stern, and always looking to get Todd’s job as manager. Todd has some very unusual employees. Take Manmeet, for example, played by Sacha Dhawan, a master flirter on the phone but a goofball when he meets women in person. Gupta, played by Parvesh Cheena, can never stop talking, but does have a sensitive side. Asha, played by Rebecca Hazlewood, is Todd’s love interest. Todd actively tries to pursue her but is hindered by her arranged marriage ideals. Todd finds familiarity in Charlie, another American manager who had to be transferred.